The Secretariat Pro Tempore of the Inter – American Convention for the Protection and Conservation of Sea Turtles (IAC) is pleased to inform you that the Venezuela Foreign Ministry has confirmed receipt of the accession documents of the Dominican Republic. The Dominican Republic has become the 16th Party to the Convention on 26 July 2017. The Ministry of Environment and Natural Resources in Dominican Republic has appointed Ms. Cristiana de la Rosa as the IAC Focal Point. We welcome our colleagues from Dominican Republic and we look forward to joining our sea turtle conservation efforts. On November 29th, 2017, the members of the East Pacific Leatherback Network (LaudOPO) met during the VI Regional Sea Turtle Symposium of the Southeast Pacific, to attend the “LaudOPO Workshop on Bycatch”. Objectives of the workshop included updates of conservation projects, monitoring and the measures for reduction of bycatch, as well as identifying priorities and next steps regarding bycatch in the region. The IAC Secretariat PT is a member of LaudOPO network, and gave a presentation on the IAC Countries progress on the implementation the Resolution for the Conservation of the Eastern Pacific Leatherback Turtle. The presentation included the activities reported by countries in compliance with the resolution for those that are in the leatherback range of distribution (Chile, Costa Rica, Ecuador, Guatemala, Mexico, Panama, Peru and the United States). The IAC also highlighted the country commitments under the Convention. The IAC Scientific Committee delegate Mr. Javier Quiñones presented the results of the project about exchange of knowledge and capacity building between Peruvian fishermen and Mexican biologists at East Pacific Leatherback index beach in Mexico. This is an activity lead by the IAC Secretary Pro Tempore with support of Marine Turtle Conservation Fund and the Government of Mexico and Peru. Ms. Caceres called the attention of LaudOPO network to the IAC leatherback resolution to highlight the importance of the contributions from this team of scientists to the implementation of the activities of this resolution in their countries. Other presentations included monitoring and information on incidental captures of leatherbacks in Chile and Peru carried out by IMARPE, IFOP, ACOREMA, Prodelphinius and Eco-Oceanica. Additionally there was a discussion to identify knowledge gaps, and to prioritize the next steps for LaudOPO. 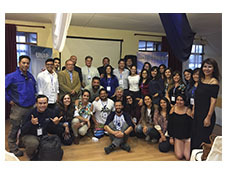 The event was organized by Arturo Prat University, Chile´s National Sea Turtle Working Group, and Arica´s Regional Sea Turtle Working led by Chile´s Fisheries and Aquaculture Under-secretary. 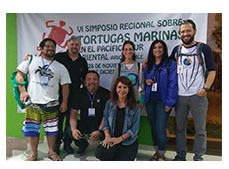 The Inter-American Convention for the Protection and Conservation of Sea Turtles (IAC) Secretary Pro Tempore attended the event, along with delegates from the IAC Scientific and Consultative Committees from Chile, Peru, the United States and Uruguay. The IAC Scientific Committee delegate from Peru, Dr. Javier Quiñones, presented the “Conservation Actions by Peruvian Fishermen interacting with Leatherback Turtles (Dermochelys coriacea) based on the Mexican experience”. This work is the result of a project done with support of IAC Secretariat PT and the Marine Turtle Conservation Fund. It summarizes the exchange of experiences between Peruvian and Mexican fishermen and biologists at an East Pacific Leatherback nesting beach in Mexico. Dr. Quiñones also presented a poster form IMARPE titled “Should I Stay or Should I Go? El Niño and the green turtles in Virrilá Estuary, North Coast of Peru.” The Consultative Committee of Experts (CCE) delegate Dr. Bryan Wallace presented the “Status of threats to sea turtles and conservation opportunities in the East Pacific”, and the CCE delegate Mr. Alejandro Fallabrino presented “New Challenges for Conservation”. The event was an opportunity to exchange knowledge, and build capacity among scientists in this region, it had the participation of researchers from Chile, Peru, Colombia, Uruguay, USA, Brazil, and Argentina. There was a pre symposium workshop on sea turtle stranding and the meeting of the regional initiative Laud OPO. 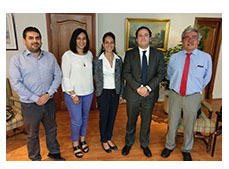 The IAC delegation consisting of the Secretary PT, Ms. Veronica Caceres, and Chile delegates to the IAC Consultative Committee, Ms. Patricia Zarate, and Mr. Jorge Azocar from the Fisheries Development Institute (IFOP in Spanish) carried out meetings with IFOP´s Executive Director, Mr. Leonardo Nuñez, and with Chile Undersecretary of Fisheries and Aquaculture, Mr. Pablo Berazaluce on Monday December 4th, 2017. The progress in the implementation of the IAC objectives was discussed during these meetings, noting that the work of the national sea turtle working group formed in 2011 has been instrumental to further the implementation of the IAC in Chile. Activities carried out by Chile include continuous sea turtle monitoring and data collection in long line fisheries done by the observer program, preparing the national sea turtle action plan, supporting the organization of the IV regional sea turtles symposium in the East Pacific carried out this year in Arica, and negotiations to declare an important sea turtle foraging area in Arica “La Puntilla” as a Marine Reserve to protect the only green sea turtle colony in Chile. As a result from the meetings, and following up on the implementation of actions under the East Pacific Leatherback Resolution, IFOP will carry out workshops with fishermen on best practices to handle and release sea turtles incidentally caught in the longline and gillnet industrial and artisanal fleets to strengthen compliance with the Resolution. The Fisheries Undersecretariat expressed their support by helping to achieve good attendance from the fishing sector. 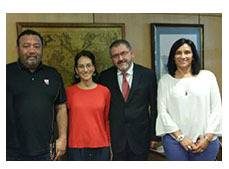 The Fisheries Undersecretariat and IFOP expressed their commitment to continue supporting the national sea turtle working group as they implement the sea turtle conservation measures that have been recommended for Chile under the IAC. The Inter-American Convention for the Protection and Conservation of Sea Turtles 14th Scientific Committee Meeting took place in Panama City on October 18 – 20, 2017, with the support of the Ministry of Foreign Affairs who is the Panama´s focal point to the IAC. The meeting was attended by the delegates from Argentina, Belize, Brazil, Caribbean Netherlands, Chile, Costa Rica, Ecuador, Guatemala, Honduras, Mexico, Panama, Peru, Uruguay and the United States, who welcomed the delegate from the new Country Party, Dominican Republic. 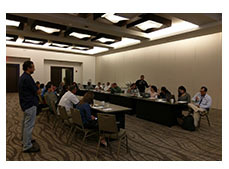 The 26 participants included the IAC Consultative Committee Vice-Chair, Mr. Joao Thome, representatives from the Aquatic Resources Authority of Panama (ARAP in Spanish), from the Ministry of Environment Direction of Coasts and Sean, and observers from WIDECAST and JustSea Foundation. The following results were attained: 1) actions to work together with the Agreement on the Conservation of Albatrosses and Petrels (ACAP) were agreed; 2) a procedure was developed to enhance the collaboration with the Regional Fisheries Management Organizations (RFMOs); 3) a form was recommended to follow up on the compliance with the IAC Resolution for the conservation of the loggerhead turtle (Caretta caretta); 4) the Annual Report Resolutions forms on Hawksbill and fisheries were updated; 5) forms to report environmental data from nesting beaches were developed; 6) the SC prepared a letter to acknowledge the work of the ICCAT Sub-committee on Ecosystems and Bycatch; and 7) the terms of reference for a study on legal and illegal trafficking of Hawksbill product in the IAC region were developed and will be shared with the CITES Convention Secretariat. During the Working Groups (WG) sessions, the Exceptions WG established the guidelines for the regional analysis on the olive ridley (Lepidochelys olivacea) population trend; and the Nesting WG agreed to update the Technical Document on Nesting Areas with the information that the delegates will provide during the SC15 in 2018. Honduras offered to be the host country for the following meeting, which tentatively will take place in October 2018. 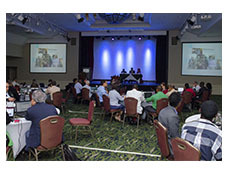 In the framework of the capacity building strategy regarding sea turtle conservation, the Ministry of Environment of Panama through their Coastal and Oceans Agency, and with the support of the United Nations Development Program (UNDP) convened representatives of judicial and environmental agencies at a “Workshop on hawksbill turtle Eretmochelys imbricata products identification, and the country commitments under IAC Convention” carried out on October 17, 2017 in Panama City. The Inter-American Convention for the Protection and Conservation of Sea Turtles (IAC) Secretary Pro Tempore, Ms. Veronica Caceres and the Chair of the Scientific Committee, Dr. Diego Albareda, were invited to facilitate the first part of the workshop, and presented the country commitments under IAC Convention, and highlighting the activities carried out with the community of Isla Canas as part of the implementation of the Resolution on Exceptions (CIT-COP6-2013-R1). The participants learned about the recent approval of Panama Action Plan for the Protection of Sea Turtles 2017 – 2021. Additionally, there was a review of the current regulations and their implementation in Panama, including a presentation of the first criminal proceeding that resulted in a $2,000 dollars fine to a citizen because of illegal trafficking of sea turtle eggs. The second part of the workshop was a training to identify hawksbill products lead by Dr. Didiher Chacon, Costa Rica´s IAC Scientific Committee delegate. 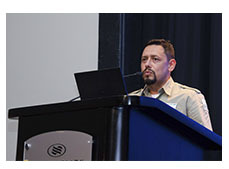 Mr. Chacon presented different methods to differentiate between plastic, horn and hawksbill shell. The participants participated in a practical session where those methods were used. The workshop concluded with a QA session. Within the framework of the Inter-American Convention for the Protection and Conservation of Sea Turtles 14th Scientific Committee Meeting in October 18 – 20, 2017, the IAC Secretary Pro Tempore, Ms. Veronica Caceres, the Vice Chair of the IAC Consultative Committee Mr. Joao Thome, and Panama´s delegate to the IAC Scientific Committee, Mr. Marino Abrego, visited the sea turtle conservation project in Punta Chame, located in the Pacific coast of Panama, 100 km from the capital. This project began in 2014 with the sponsorship of Banitsmo and it is managed by Fundacion Tortuguias directed by Ms. Kerya Hernández. 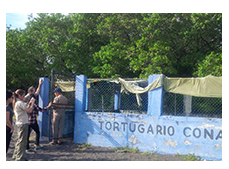 Tortuguías has the mission to protect the sea turtle nests and monitors their development in the hatcheries mainly of olive ridley (Lepidochelys olivacea). 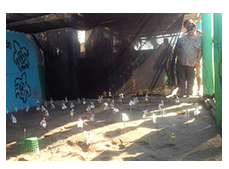 The project carries out activities such as night patrols at nesting beach, nest relocation, and capacity building in the community. Thanks to the work of a team led by the field biologist Ms. Eloisa Carpintero, who gained experience as an intern at Isla Cañas Index nesting beach, the IAC delegation experienced the excellent organization and management of the hatchery. So far for the 2017 season there were 170 nests protected already in this location and more were expected. During this visit there was an exchange of experience on how to manage and monitor sand /nest temperature, this is a significant issue that needs attention in this area where sand temperature tends to be high. The eighth conference of the parties COP8) of the Inter-American Convention for the Protection and Conservation of the Sea Turtles (IAC) concluded successfully in Buenos Aires, Argentina. Between June 28 – 30, 2017, Buenos Aires hosted the delegates from 12 IAC Parties (Argentina, Brazil, Costa Rica, Ecuador, Guatemala, Honduras, Mexico, Panama, Peru, United States of America, Uruguay, and Venezuela), accredited observers from local and international non-governmental organizations (i.e. Foundation Mundo Marino, CONICET-INIDEP, Karumbé, Humane Society International, Center for Biological Diversity y JustSea) and the Agreement on the Conservation of Albatrosses and Petrels (ACAP) Executive Secretary. The Minister of Environment Rabbi Sergio Bergman welcomed the participants expressing good wishes for a productive meeting and a joyful stay in Buenos Aires. COP8 updated the existing resolution on Conservation of Hawksbill Turtle by including language to strengthen and increase the effort to eliminate Hawksbill turtle’s illegal traffic, and adopted the resolution to continue with the Convention Secretariat Pro Tempore. The Leatherback Task Force recommendations based on Resolution CIT-COP7-2015-R2 for the Conservation of the Eastern Pacific Leatherback Turtle (Dermochelys coriacea) were adopted. Also, IAC Parties drafted a Declaration on the Promotion of the Conservation of Sea Turtles and its relation to the United Nations General Assembly Resolution 69/292 on the “Development of an international legally binding instrument under the United Nations Convention on the Law of the Sea on the conservation and sustainable use of marine biological diversity of areas beyond national jurisdiction”. The Agreement on the Conservation of Albatrosses and Petrels (ACAP) Executive Secretary, Mr. Marco Favero, presented the Memorandum of Understanding recently signed between the IAC and ACAP. Both organizations will work together on matters such as bycatch mitigation in fisheries, promoting better data collection and report on bycatch from RFMOs among others. COP8 received a report from the United Nations Development Programme (UNDP) on the Sustainable Development Goals of Agenda 2030, highlighting Objective 14 to conserve and sustainably use the oceans, seas and marine resources for sustainable development, and how the IAC plays an important role in this global effort. The IAC Secretary Pro Tempore Ms. Veronica Caceres announced the adhesion of the Dominican Republic as a new IAC member. Peru presented their joined actions with Mexico and the United States building capacities in the fishing sector for the conservation of the Eastern Pacific Leatherback turtle in this country. The presentation included a video summarizing the visit of four Peruvian fishermen to the leatherback nesting beach Barra de la Cruz (Oaxaca, Mexico) to experience and join conservations efforts that are being carried out by Mexico conservationist and fishermen. IAC Parties agreed on the need to strengthen their work with the help from the foreign affairs ministries and relevant international bodies to encourage the adhesion of new countries to the IAC, among those are Canada, Colombia, El Salvador, and Nicaragua. COP8 was sponsored by the Republic of Argentina through the Nation´s Ministry of Environment and Sustainable Development, and the Ministry of Foreign Affairs and Worship, their support and hospitality lead to a successful meeting. 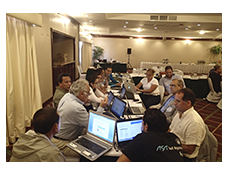 At the Sustainable Ocean Initiative (SOI) Capacity-Building Workshop for the Wider Caribbean, and Central America, carried out on February 20 – 24, 2017 in San José, Costa Rica, the Inter-American Convention for the Protection and Conservation of Sea Turtles (IAC) Consultative Committee of Experts delegate from Costa Rica, and Manager of the Leatherback National Park Mr. Rotney Piedra, gave a presentation on the IAC regional efforts on behalf of the Eastern Pacific Leatherback turtle. This population is critically endangered. The Sustainable Ocean Initiative (SOI) is a global platform that aims to build partnerships and enhance capacity to achieve the Aichi Biodiversity Targets in marine and coastal areas. Therefore, the workshop organized by the CBD Secretariat and Costa Rica´s Ministry of Environment and Energy aimed to enhance the capacity of countries in the region to conserve and sustainably use marine and coastal biodiversity. The workshop focused on regional experiences and approaches supporting integrated marine and coastal management. In the presentation titled “Regional Conservation Efforts of the Eastern Pacific Leatherback Turtle”, Mr. Piedra stated the critical situation of this population. The information available shows that this is a highly migratory species with a defined connectivity path between nesting habitats and foraging areas in the high seas. Mr. Piedra highlighted that the information provided by Ms. Laura Sarti, from Mexico National Commission for Natural Protected Areas (CONANP in Spanish), shows a declining number of females in Mexico´s index beaches, information that is consistent with a similar scenario in Costa Rica. The IAC is implementing Resolution CIT-COP7-2015-R2 Conservation of the Eastern Pacific Leatherback Turtle. Five strategic actions have been recommended as a priority to be implemented, such as bycatch reduction in fisheries; identification of areas of high interaction with fisheries; protect important areas for leatherback survival; eliminate any consumption and illegal use of the leatherback turtle, and protection of nesting sites. Recently the IAC recommended organizing national workshops in the range countries to agree and prioritize threat mitigation measures, the recommendations from those workshops will be presented to decision makers to be implemented. Similarly to the IAC, the regional network LaudOPO shares the commitment to promote the conservation of the Eastern Pacific Leatherbacks. Regarding local efforts, Costa Rica carries out monitoring and research programs at index beaches as well as in secondary beaches, led by NGOs, universities, civil society and SINAC. Recently, Costa Rica drafted the Protocol for Environmental Monitoring of Sea Turtle Nesting Beaches. 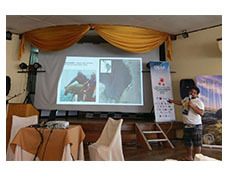 In addition, the capacity building activity “Best Practices and Techniques to increase survival of sea turtles incidentally caught in Costa Rican fisheries” was carried out in 2016, with the IAC support. Currently, Costa Rica is in the process to create a Commission for the Conservation and Protection of Sea Turtles, and two expert’s workshops about the situation of the species in Costa Rica have been conducted. It is urgent to change the current status of the leatherback turtle; this depends not only on the national efforts of each country but also on regional efforts. The strengthening of partnerships between the IAC and other conventions or initiatives such as the CBD-SOI is necessary and critical. 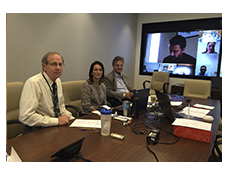 The 10th meeting of the IAC Consultative Committee of Experts (CCE) was held on February 15, 2017, by videoconference from the IAC Secretariat Pro Tempore office at the US Fish and Wildlife Service Headquarters in Virginia. The meeting was attended by delegates from eleven (11) Member Countries and four (4) sectorial members representing NGOs, Scientific, and Private Industry. 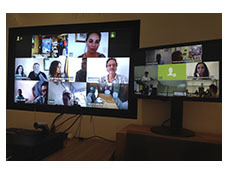 Using video conference allowed the participation of 35 delegates from the IAC region. This has been the Consultative Committee meeting with the highest attendance to date. The CCE Work Plan 2017-2018 was updated, and the recommendations from the Eastern Pacific Leatherback Task Force regarding the critical status of the species were revised and approved. These recommendations will be presented for consideration to the IAC Conference of the Parties this year. The recommendations include urgent conservation actions that countries within the range of distribution of the species could implement to mitigate the threats that they face, among them is to convene national workshops with decision makers in each country to discuss and agree on measures to implement locally to help reduce the threats. Also, progress in the implementation of the Resolution on exceptions in Costa Rica, Guatemala and Panama was discussed, and the recommendations from the IAC Scientific Committee for the monitoring of the olive ridley (Lepidochelys olivacea) population in Central America, considering that the exception applies exclusively to this species. Finally, the Committee discussed the drafting of a technical document on sea turtles foraging areas in the IAC region; the collection of data on climate change and sea turtles in the IAC; and made recommendations on potential activities to be carried out within the Memorandum of Understanding recently signed between the IAC and the Agreement on the Conservation of Albatrosses and Petrels (ACAP). At the closing remarks, the Consultative Committee honored the memory of two of its members, Mr. Les Hudson (UAS), member of the Industry Sector, and Mr. Isaias Majil, Belize´s Focal Point, who passed away in 2016 and 2017 respectively. The IAC family will remember and miss them dearly for their valuable contribution and dedicated effort on behalf of sea turtle conservation. 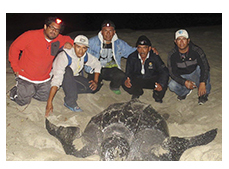 The IAC promoted an exciting exchange of experiences between Peruvian fishermen and different stakeholders involved in the conservation of the eastern pacific leatherback turtle at index nesting beaches in Oaxaca, Mexico. On Sunday, 22 January Peruvian fishermen José Fiestas, Martín Macedas, Orlando Carrillo and Pedro Alejos arrived in Mexico with the representative of Peru´s Sea Institute (IMARPE in Spanish) and IAC Scientific Committee delegate of Peru, Mr. Javier Quiñones, to have a unique experience with leatherback turtles (Dermochelys coriacea) at the index nesting beach Barra de la Cruz (State of Oaxaca). The fishermen come from different areas of Peru where there are reports of interactions of drifting gillnets with the leatherbacks foraging in these waters, which can result in incidental catches of the animals. 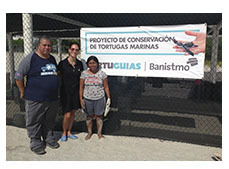 The criteria to select the fishermen was: 1) Fishermen using gillnets, which seem to have a higher interaction with sea turtles, 2) fishing in areas with the highest abundance of leatherbacks in Peruvian waters, and 3) leadership of the candidates in their community to ensure that the experience and knowledge brought from nesting beaches would be replicated and shared with their communities. 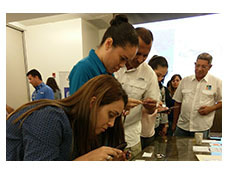 The activity took place in January 22 – 27, 2017 as part of the project “Capacity building for fishermen to create awareness and promote conservation of East Pacific leatherback turtles”, promoted by the IAC to support the implementation of the Resolution on the conservation of the eastern pacific leatherback turtle. With the guidance of the National Commission for Natural Protected Areas of Mexico (CONANP in Spanish) representatives Dr. Laura Sarti, the field technician Alejandro Tavera, and their sea turtle conservation and monitoring team based in Barra de la Cruz, the fishermen conducted nocturnal monitoring and patrolling in the nesting beach. When the group arrived, CONANP´s staff gave them talks on leatherbacks biology, migration, the critical size of the population, the connectivity between Peru and Mexico, and the importance of the species protection in Peru´s feeding grounds. The first night, the group was amazed when watching an approximately 145 cm leatherback turtle nesting, and took part in the eggs relocation at the hatchery. The following morning, they had the opportunity to release olive ridley (Lepidochelys olivacea) hatchlings and a leatherback. Excited, the group had the opportunity to observe other nesting leatherbacks during the four nights of monitoring, as well as a hatching nest and took part in the hatchlings release. 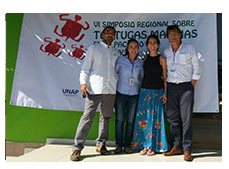 The Peruvian fishermen also visited the Mexican Turtle Center (CMT in Spanish) at Mazunte, where Dr. Heriberto Santana from the National Fisheries Institute in Mexico (INAPESCA in Spanish) and delegate of Mexico for the IAC Scientific Committee, trained them on Good Practices to handle Sea Turtles incidentally caught. The fishermen also shared time with their fellow Mexican artisanal fishers such as Mr. Sanson Audelo and his son, who spoke about their experience with circular hooks and described the fishing system in their area of Puerto Angel. It was a very friendly interaction between fishermen from both countries, and the moment allowed them to talk about the sea turtle release techniques used in each of their home countries. Peruvian fishermen were impressed with the eco-friendly engines used by artisanal fishermen in the port of Puerto Angel (Oaxaca). The activity included a visit to the area of La Escobilla, the world´s most important nesting beach for olive ridleys (L. olivacea) and where massive arrivals of between 800,000 and 1´000´000 individuals are recorded. There, Ms. Tere Luna and Ms. Erika Peralta from CONANP explained how the process of the local community from being sea turtle eggs poachers to become guardians of the sea turtles had occurred. There was great empathy between the members of the community and the Peruvian fishermen. At the end of the visit, the fishermen returned to Peru completely moved by the experience and expressed their commitment to share with their communities back home their new knowledge on the importance of their role in the survival of the leatherbacks. This activity was organized by the IAC Secretariat PT with the financial support of the US Fish and Wildlife Service Marine Turtle Conservation Fund through the project “Capacity building for fishermen to create awareness and promote conservation of East Pacific leatherback turtles”. The implementation of the activity also had financial and technical support from the National Commission for Natural Protected Areas of Mexico (CONANP), the National Fisheries Institute of Mexico (INAPESCA) and Peru´s Sea Institute (IMARPE). Guatemala reinforces sea turtles hatcheries management. 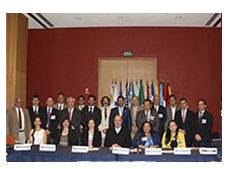 A new activity to strengthen capacities of member countries of the Inter-American Convention for the Protection and Conservation of Sea Turtles (IAC), took place on November 29-30, 2016 in Guatemala. 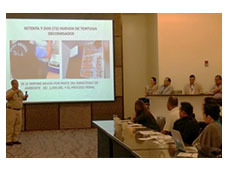 The workshops “Developing Technical Capacities for the Management of Sea Turtle Hatcheries in Guatemala” were sponsored by the National Council of Protected Areas (CONAP), US Fish and Wildlife Service (USFWS), the IAC and the non-governmental organization ARCAS. 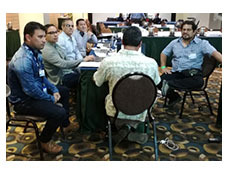 The first workshop (November 29th) took place at the Pacific Navy Force Command, with the participation of 25 representatives of 12 hatcheries from San Jose Port community. Activities during the workshop included visiting the hatcheries of the Navy Command (CONAPAC) and Monterrico, managed by the Conservation Studies Center (CECON). The second workshop (November 30th) took place at the community Las Lisas; there were 16 participants representatives of six hatcheries from this community. Participants visited “Las Lisas” hatchery, managed by the Fisheries and Aquaculture Agency DIPESCA/MAGA. The workshop trainer Mr. Didiher Chacón, delegate of the IAC Scientific Committee provided information about sea turtle biology and threats, hatcheries construction and management, sand quality, egg incubation temperature, hatchling release, nests exhumation and data gathering for monitoring. During the Q&A session participants clarify their questions on local issues on management and administration of their hatcheries. The workshops meet our objective of strengthening the capacities of those in charge of sea turtle hatcheries for the specie olive ridley (Lepidochelys olivacea) in Guatemala, and helped the implementation of the IAC Exceptions Resolution. WORKSHOP ON SEA TURTLE STRANDING, FIRST AID AND NECROPSY (BELIZE). 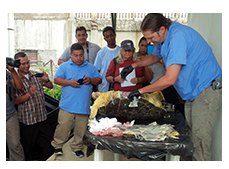 The “Workshop on Sea Turtle Stranding, First aid, and Necropsy” took place from 25th to 26th of August, 2016 at Belize Fisheries Department headquarters in Belize City. The workshop was organized by the Inter-American Convention for the Protection and Conservation of Sea Turtles (IAC) Secretariat Pro Tempore jointly with the Fisheries Department of the Ministry of Agriculture, Fisheries, Forestry, Environment and Sustainable Development of the Government of Belize. The workshop is one of the capacity building activities promoted by the IAC in response to the needs of the member countries. The workshop lectures were taught by DMV Brian Stacy (NOAA) and DMV Diego Albareda (Buenos Aires Ecopark and Chair of the IAC Scientific Committee). During day one of the workshop, participants learned the basic principles of stranding and mortality investigation; the pathology and common parasites of sea turtles; postmortem examination and human interaction. During the necropsy lab, the participants were trained in the techniques to perform a necropsy in field conditions, and how to collect tissue samples. 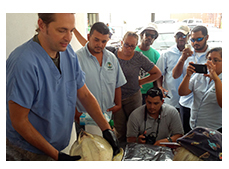 Necropsies were conducted on sea turtles found stranded in the months prior to the workshop. On day two, the workshop focused on first aid and basic care techniques of stranded sea turtles by field responders, initial evaluation, diagnosis, therapeutics, and sedation. The 21 participants at the workshop included veterinarians, biologists and technicians working in the Marine Protected Areas for the Belize Government throughout the country and local NGOs. Each participant received a basic necropsy kit with instruments that they will use in the field. 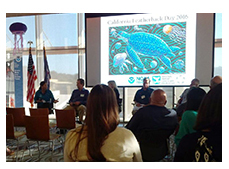 On October 6th, the Inter-American Convention for the Protection and Conservation of Sea Turtles (IAC) Secretary Pro Tempore, and members of the IAC Scientific Committee participated in California Leatherback Day event that took place at NOAA Southwest Fisheries Science Center in La Jolla, California. The Leatherback turtle travels 6,000 miles across the Pacific Ocean to feed on jellyfish in the United States west coast. Thespecies is critically endangered due to incidental catches; direct takes; coastal development that destroys nesting beaches; pollution that causes pathogens; and climate change. The Leatherback has been designated as California´s Official State Marine Reptile since 2012. This designation urges public schools to include the species in their curriculum, as well as the state and federal agencies to implement proactive conservation measures to prevent the threats to this species. To raise awareness and bring attention to the conservation of leatherbacks, Dr. Peter Dutton (NOAA), and his team organized talks and videos on NOAA´s national and international research, and a discussion panel including outreach and education, mitigation measures in fisheries interactions and the role of consumers and culinary community in marine conservation. Students, educators, fisheries sector representatives, NGOs, local artists and scientists attended the event. Participants received information about conservation efforts at Indonesia nesting beaches, which is where the leatherbacks that visit USA waters come from; main threats, population status and challenges of transboundary species bycatch mitigation. A productive exchange of ideas between fisheries sector, researchers and the civil society conservationists took place highlighting the conservation efforts that each sector carries out in benefit of the leatherback turtle. Thirteenth IAC Scientific Committee Meeting. The Inter-American Convention for the Protection and Conservation of Sea Turtles Scientific Committee 13th meeting (SC13), took place between August 29th and September 1st, 2016, in Belize City, with the support of Belize Fisheries Department, with the coordination of Lic. Isaias Majil (Belize Focal Point), and Licda. Kirah Forman. 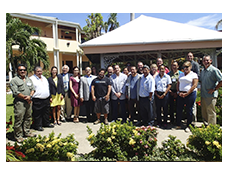 The meeting included the participation of 22 delegates from 13 countries, who discussed the progress of 2016 work plan, and updated the 2017-2018 work plan for the committee, including sea turtles interactions with fisheries, stranding, climate change, and exceptions. The committee discussed the information presented by Honduras concerning the legal, social, economic, and technical data conditions of Lepidochelys olivacea eggs harvest in Golfo de Fonseca, and provided recommendations to increase the data available on this nesting population. 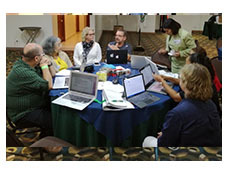 The IAC Foraging Areas Working Group was formed, and the contributions of the CC13 to the draft of the document “Status of Loggerhead Turtles (Caretta caretta) within Nations of the Inter-American Convention for the Protection and Conservation of Sea Turtles” were included. The technical document and recommendations on the “Characterization of Sea Turtle Stranding Information in the IAC Region” were approved. In the last day, the committee delegates took part in a beach cleaning activity at the nesting index beach Baccalar Chico, severely affected by hurricane Earl when passing through Belize. Dr. Diego Albareda (Argentina) was elected as Chair of the Scientific Committee and Lic. Francisco Ponce (Chile) as Vice-chair. Ninth Meeting of the IAC Consultative Committee of Experts. 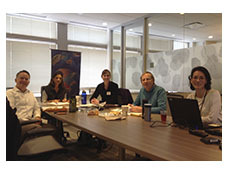 The 9th meeting of the IAC Consultative Committee of Experts (CCE) was held on April 19th 2016 by videoconference from the IAC Pro Tempore Secretariat office at the US Fish and Wildlife Service Headquarters in Virginia. The meeting was attended by delegates from (10) ten Member Countries, seven (7) sectorial members representing NGO, Scientific, and Private Industry, and the Chair of the IAC Scientific Committee. With participation of 25 delegates this was the meeting with the highest attendance to date. This was made possible by using video conferencing as work tool that has facilitated the attendance of delegates from different agencies within the Member countries. At the meeting the CCE Work Plan 2016-2017 was updated, and there was a discussion on the IAC Scientific Committee recommendations for the collection and report of information on Climate Change and Sea Turtles, as well as on the implementation of the IAC recommendations on exceptions for Guatemala, Panama and Costa Rica. The activities of the Eastern Pacific Leatherback Task Force were discussed and new tasks for this group were agreed regarding the identification of immediate strategies to reduce the threats that are causing the decline of this population, and the need of a more detailed examination regarding the compliance of the Resolution for the conservation of this species in the Member Countries. Finally, the NGO sector proposal to create a mechanism for NGOs to submit cases /petitions regarding activities that are a potential threat to sea turtle survival or the conservation of their habitats was discussed. During the meeting the IAC Secretary PT reminded participants that the nomination process for sectorial members to this committee will begin no later than January 2017, therefore those who are interested are welcomed to send their nominations. Sectorial members will be appointed at COP8 in 2017. The current Chair of the Consultative Committee of Experts Mr. Paul Hoetjes (Caribbean Netherlands) as well as the Vice-Chair Mr. Joao Thomé (Brazil) were re-elected to continue leading the CCE for the next two years. The next CCE10 meeting will be held on March 2017. 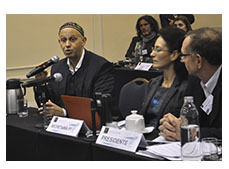 The Seventh Meeting of the IAC Conference of the Parties (COP7) was held in Mexico City, from 24 to 26 of June, 2015. The meeting was attended by delegates from 11 countries (Argentina, Brazil, Costa Rica, Chile, United States, Ecuador, Honduras, Mexico, Caribbean Netherlands, Peru and Uruguay), and accredited observers from local and international NGOs. Three important resolutions were approved that deal with the conservation of the Eastern Pacific leatherback turtle, conservation of the loggerhead turtle and the exception presented by Costa Rica under Article IV (3a and 3b) for subsistence harvesting of Lepidochelys olivacea eggs. Argentina was elected the next COP Chair and Brazil Vice -chair. The next Conference of the Parties (COP8) will be held in Argentina in 2017. COP7 was sponsored by the Government of Mexico through the National Commission of Natural Protected Areas (CONANP), the Secretariat of Environment and Natural Resources (SEMARNAT) and the Marine Turtle Conservation Fund – USFWS.